Water is important to me, heck…it’s important to all of us since about 75 percent of our body is water; my entire life I have looked at water, whether it be ponds, lakes, rivers or even streams. I can’t drive over a creek without taking a glance and evaluating it…too muddy, too deep, just the right color, riffles that could hold fish, and the list goes on and on. You may do this as well and if you do I would venture that, like me, you are a fishermen. This ‘craziness’ can at times be an issue but more times than not it leads to investigation and in today’s world it isn’t hard to find info on streams and creeks to see if indeed they hold the ‘holy-grail’ which for me is a smallmouth. Actually I have become very good at eyeballing a stream and evaluating its worth as it has to have some movement, good water clarity, some structure, etc…that would even lead me to start to wonder, “Is this a stream that could be fished”? This is exactly how I began to fish Big Walnut Creek. For years I had driven over the creek at a few spots…mostly as I was riding a school bus on the way to a match or game. A few years back I decided to do some internet searching and to my surprise found an article about a fellow who had caught and landed a 40 plus inch musky from Big Walnut. I was intrigued and that was all it took…one thing led to another and with good maps I was able to locate several areas that could be traversed by foot-and thus I did. I still can remember my first travail down BW; I hadn’t gone less than a hundred feet when I made a cast into a ‘fishy’ looking area and next thing I knew I was anchored to a bruiser of a smallie and it was ripping downstream. A few minutes later I was able to lip a beauty of a fish…a 16 inch, chubby smallmouth. My intuition was confirmed and since that moment, a few years back, I have walked many miles of the BW…some has been good, some great, but each stretch has had fish. A couple weekends back me and Frank took off at noon and by 1pm were working our way from east to west down about a five mile section of the creek. The water was up a bit and still just a hair off color which is usually a great combo. Contrary to popular belief clear water isn’t a great thing; as fly-fishermen we have to be extra careful, it requires longer cast and one must always be cautious about polluting the stream, especially while fishing downstream. On this day it was near perfect and one by one I started picking off fish…nothing huge but several 12-13 inch fish, that in current, really put up a great battle. Another benefit of fishing these smaller, less known creeks, is the solitude; aside from a heron and a few crows I had no company at all on my four hour journey. When I finally got to our pick-up point I looked up and saw Frank standing atop the bridge and he was smiling from ear to ear. “Well-let me have it…and unless you have a picture, remember it is all lies”! I yelled at Frank above the water flowing by me and he just continued to grin, he reached into his upper pocket and pulled out his little camera. I knew he had had a good day…he needed one as he had had a few stressful moments in the past five or six weeks. 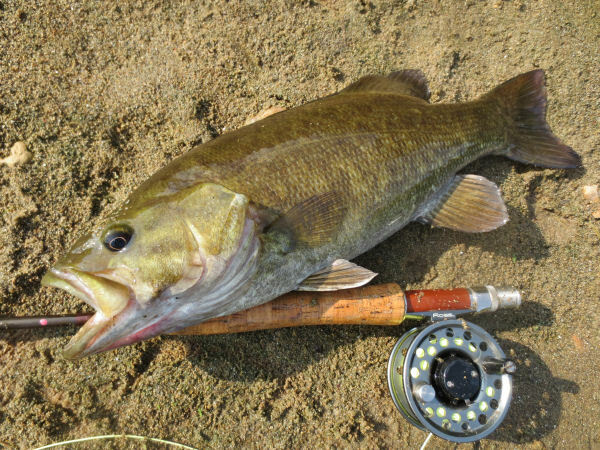 I made my way around and through the heavy weeds and up the side of the bridge and by that time Frank had his camera fired up and for sure had caught a beast…a chunky, emerald colored, 16 inch smallmouth. We talked for a minute about our few hours and Frank for sure had had one of ‘those-days’ whereby things had gone his way; he had landed the big fish and a couple others at 15 inches…with a few others just short of that size. Fast forward a few days and dad and I were once again back upon BW. I looked at my watch and told dad I would meet him at the next bridge at 6:30pm and knew that I had to hustle as this stretch can take 4-5 hours to walk. Off I went, the first 45 minutes was slow with some flashes but no fish caught. Experience is a great thing and experience is at times what I have the most of so I tied on a new, yellow, bunny strip streamer and made a cast, down and across when bang, a quick strip set and on the other end was my first fish of the day. The next hour or so was certainly ‘Fast and Furious’ as I hooked into one fish after another…the largest was a real trophy at 17 inches long. Truth is the big fish gave me a fantastic battle because I had landed it in one of the ‘bottle-neck’ areas where the stream constricts and this big guy was exactly where he should have been. His stomach was protruding for good reason as I am sure he had been making small work of any baitfish, crayfish or any other food source that had been funneled into his very own KZ (kill zone). I popped up out of the weeds at 6:41pm and had that same smile that Frank was wearing just a few days earlier. Dad and I discussed the fishing as I sat and removed my wet waders…just can’t really appreciate these little creeks until you get out and slosh through one! 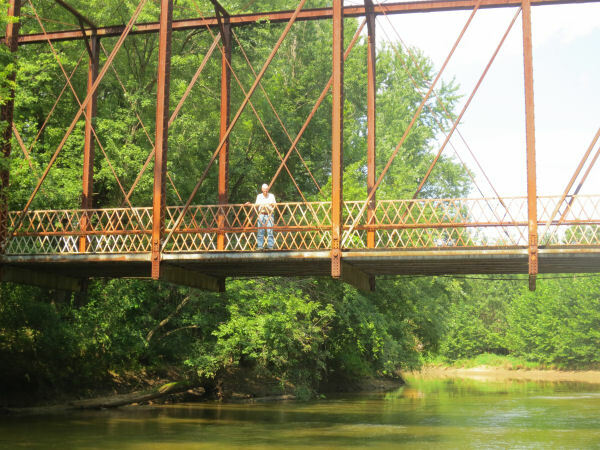 You can watch the video here >> Fly Fishing Big Walnut Creek. 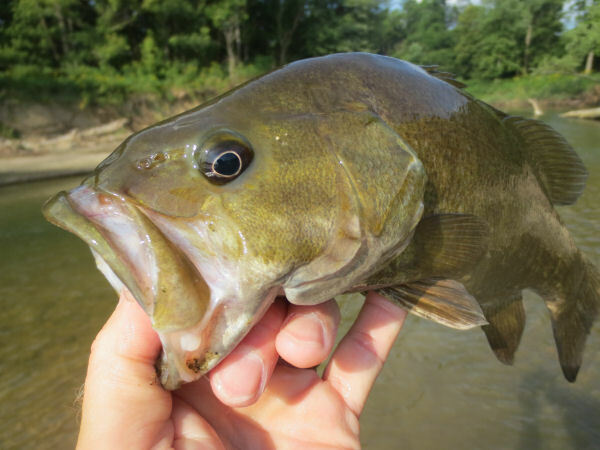 If you’re looking for a place to ‘splash-down’ and maybe catch a few smallies then look no further than the many small streams and creeks that we have here in Southern Indiana; I know you will have a great time and better Enjoy the Great Outdoors. Really enjoy your videos and wanting to try fly fishing. I live very close to Bakers Camp bridge and Route 36. Wondering if you have tried this area of the BW. Which area would you recommend? Thank you and keep up the good work on the videos.